Fashions in business thinking change constantly. The way we think about leadership, for instance, has shifted radically from the instinctive entrepreneurial genius of greats such as Rockefeller, Carnegie and Ford, through leadership as a science, leadership that releases human potential, the leader as a strategist and warrior, customer champion, globalist and shareholder advocate, to, more recently, leadership as stewardship for the environment. Hundreds of models have been developed to track, measure and forecast business solutions, but as fashions shift how can we apply them in real organizations that have to succeed outside the classroom? 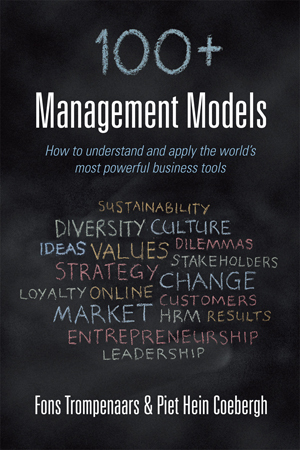 100+ Management Models gives a quick overview of the key features and potential applications of each of the most important models in nine different categories: sustainability, innovation, strategy, diversity, customers, human resources, benchmarking, leadership and implementation. At the end of each section, there is a summary of the key dilemmas that tend to emerge from the particular function, along with analysis of potential solutions. Our free ebook, 10 Management Models offers a taster of what this book provides and can be downloaded for free on Kindle here.